Google's Streetviews Cars Learn to Read? Google’s Streetviews Cars Learn to Read? That really shouldn’t have been a surprise back then. I wrote a post in 2007 titled Better Business Location Search using OCR with Street Views which described how Google might use OCR to gather information from signs it takes video of for street views. The patent filing I wrote about really didn’t discuss how that information might be used, but it presented the possibility of its use. I suspect my real life robots.txt file would have been ignored back then, though the drivers of those cars had learned at that point that signs like “Private Street” and “Military Base,” were areas they couldn’t film. A system and method for calibrating a scoring function. The scoring function S(input, classification) provides a score based on the amount of evidence a particular input has in connection with a particular classification. For example, a street level image may be OCR’ed so as to indicate the names of establishments contained within the image, and the scoring function indicates how much evidence exists within the image for a particular establishment. Some establishments (i.e. classifications) may produce higher scores based on the nature of the establishment rather than the nature of the image (i.e. input) causing any ranking of establishments done on the basis of the scoring function to be biased. Accordingly, the scoring function is calibrated by determining the probability distribution of scores for an establishment over a false set of images that do not display the establishment. The scoring function is calibrated so as to adjust the score to overcome such bias. The patent provides details on how it might compare a combination of streetview image information and web information to better learn about the things it’s mapping and to incorporate information like GPS and cell phone triangulation into those scores as well. While I mention street views images as the source of real world data, the patent seems to expand what it considers a “client device” to be used in a system like this to possibly include cell phones as well. I can’t help but wonder if a possible future use of video from something like Google’s Project Glass could also be used in a similar manner. As far as we can tell, Google doesn’t try to use optical character recognition (OCR) on text within images that it finds on web pages to learn more about those pages. At least not yet. But it’s interesting to think that Google might be gathering textual information from the world around it to improve the Maps it shows us, and to try to index the world around us better. Google Maps isn’t just a database that can be used to provide driving directions and navigation. It’s purpose isn’t just to act as an online yellow pages to make it easier to find telephone numbers and address information. Google Maps is one of the richer knowledge bases being built today, and the information that Google collects about the World can be used to make its Web search smarter as well. Impressing and scary at the same time. Next up: Google will enter the real estate business and start appraising homes based on millions of images of “similar” homes across the nation. I remember before starting University here in Oxford, I checked streetview from my hometown in Colombo, Sri Lanka where I was able to see the house I was going to live in and the university entrances and all that. It was truly amazing to be able to see so vividly another location at the comfort of your own home. Getting visa’s to first world countries like the UK, Australia and the US are very tough (especially if you’re not financially well to do, or aren’t well connected), so streetview was one of the ways we’d explore just to get a glimpse of how streets and houses look like in New York, London or even California. So I am all for technology and digitising the real world. But this to me is taking it a little too far. But as with anything Google, I’m sure there’ll be more reasons to allow google to digitise your small business than not to (if and when they implement this/or if they have already implemented this). Any idea how long it takes data taken by your car to make it to google maps? I waved at a car and i have been waiting for it to update to my beautiful face. 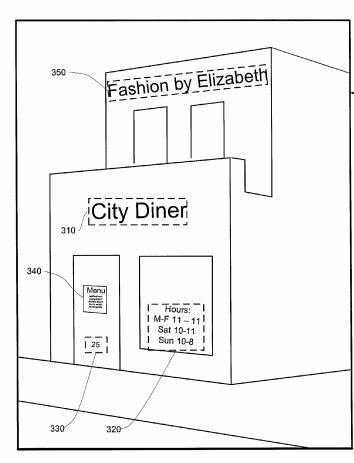 If the streetcars start to read, I wonder how long it’ll take for Goog to compare the writing on shop and office fronts to the information provided on G+ Local pages and find yet another way to penalize small businesses… Over optimized shop fronts? Keyword stuffed sign-writing? What about large office buildings in CBD’s. In these cases it will be tough for them to make an assesment as to what’s in those buildings but for pizza joints and such this will be an amazing feature for both more accurate listings and also integrating in new features in years to come if they use it as I imagine they are. Google may not be able to use signs on larger office buildings, but for many other businesses, the ability to use printed signs to verify and compare to information on the Web can help make Google Maps a lot more comprehensive. I think some interesting things are developing, too. Previous Previous post: Spoken and Visual Queries The Future of Search?